Why can I not just say what I think, why do I just not say ‘no’!! Oh well here we go let’s give it a bash, ‘just 5-600 words’ she said. Brings back memories of filling out SRDP funding applications and watching the number counter at the bottom of Microsoft Word. That’s another story. Anyway, I am John Sinclair and I ‘farm’ at West Craigie Farm just between Edinburgh and South Queensferry. It is getting harder and harder to say that I am a Farmer. 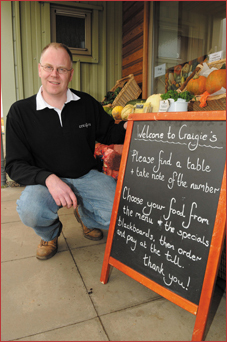 We have a farm shop and cafe at Craigie, although we still grow soft fruit all of the arable ground is contract farmed. More and more of my time is spent in the office or speaking to customers in the shop. Do I miss ‘farming’? Having just returned from a trip to the village and seeing all my neighbours busy sowing spring barley I cannot help but wish that I was sitting on that tractor seat working from dawn till dusk. These days are past, I just need to hope that my mate Andrew needs a hand at harvest and my wife Kirsteen lets me away for a week’s holiday to drive his combine, his plough or even just sweep the floor in his grain store!! ‘...what is going on on the farm?’ Well with soft fruit there is not really a quiet time of the year, we are busy building a new block of tunnels, getting tunnels covered, getting crops fleeced the list goes on. Our early strawberries are just about to come into flower (end of March) so we should be picking fruit in May this year. Our long cane raspberries are breaking bud nicely and are looking good at the moment! Usually we have a lot of wheat but Willie only managed to get a couple of fields in last autumn, the ground is now drying out and is ready to be sown with Spring Barley (fortunately he managed to secure an early contract for it) in the next few days. The tattie guys are putting in about 40 acres here this year; they had quite a few visits to the workshop to repair their plough when they ploughed one of the stonier fields on the farm. I used to contract de-stone about 300 acres so I do not envy their job at Craigie this year! We are busy gearing the shop up for Easter, the first weekend in April we have a ‘Nature Weekend’ in partnership with the RSPB. Yes I have joined RSPB! There are a lot of things that I do not agree with them, but I feel that I have the chance to try and get a farmers point of view over. This is what drives me with all of the school visits we do on the farm. I have the ideal opportunity to try and get the farmers message over to the public, ‘we grow food for you’. We are getting involved for a second year with LEAF’s open farm Sunday on the 7th of June – with an open farm weekend. This year we have been selected for LEAF’s media launch of the event so hopefully it will bring us some good PR and lots of visitors. I was amazed last year, we spent a lot of time organising the weekend and it was the ‘meet the fruit farmer’ that was the most popular bit. Just my fruit manager, Iain, standing at the end of a tunnel talking about modern fruit production, simple so why do more of you not get involved? Oh no, 617 words! I had better stop now!